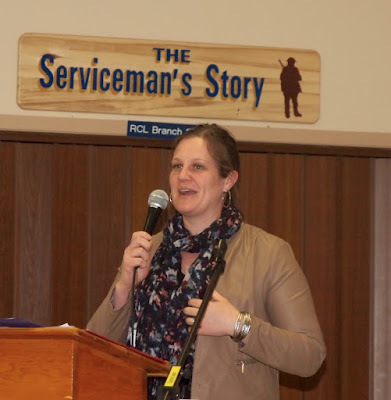 The Caroline Community recognized its volunteers at a Volunteer Appreciation event at the Caroline Legion on Monday, April 8. 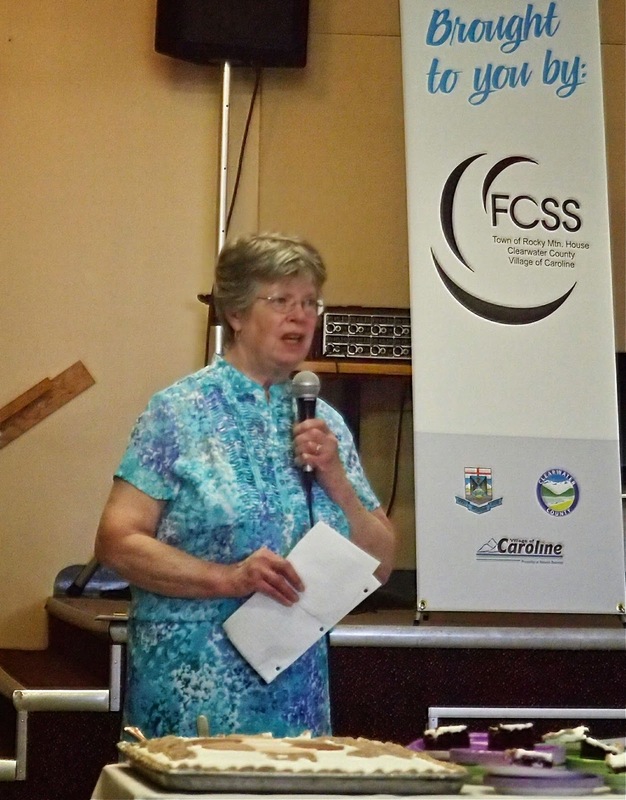 261 people were nominated by their peers as volunteers in the community this year and some 100 attended the event. A highlight of the celebration was the presentation of volunteering awards, based on nominations from the community. Joshua Luoma was given the Outstanding Youth Volunteer Award and Ida Stange was recognized as the Volunteer of the Year. Yvonne Evans, currently enjoying a holiday in warmer climes, was given the Lifetime Achievement Award. 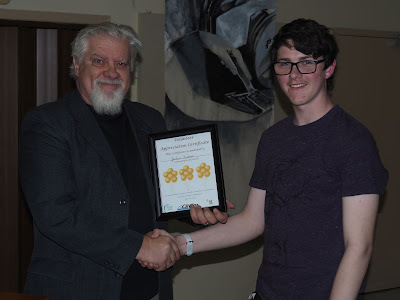 Numerous door prizes donated by local businesses and individuals were greatly appreciated by those in attendance and musical entertainment was provided by volunteers Louis Massicotte and Joshua Luoma. (Rocky Mountain House, AB) – Following a three-month competitive recruitment campaign, Council is pleased to announce that Rick Emmons has been formally appointed to the position of Chief Administrative Officer (CAO) for the County, as of May 1, 2018. Council appointed Mr. Emmons as Interim CAO back in November, to allow time for a thorough recruitment process to unfold, in an effort to identify the best candidate for the important administrative role of CAO. 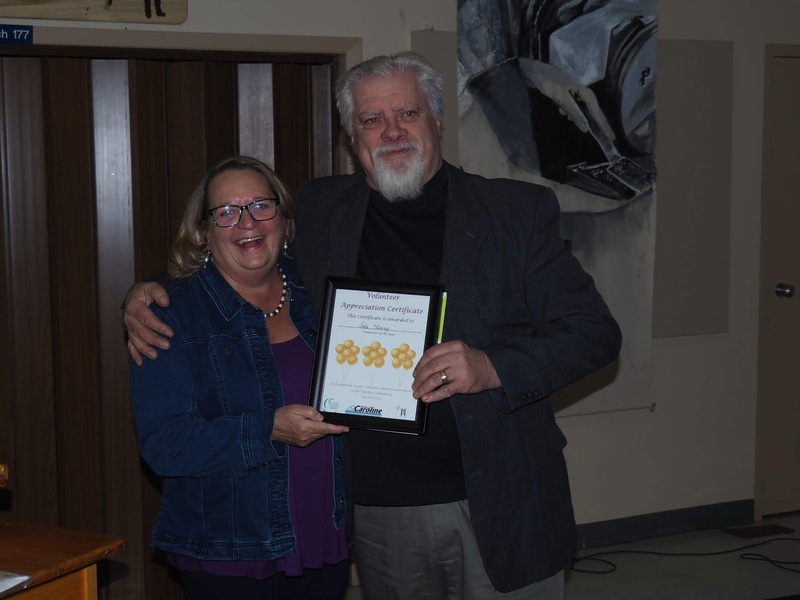 “Clearwater County has been fortunate to have Rick’s leadership and guidance over the last five months, and he has been instrumental in providing for business continuity, administrative stability and maintaining the County’s progressive momentum,” said Clearwater County’s Reeve John Vandermeer. With 33 years’ experience in municipal government, Mr. Emmons was most recently the County’s Director of Planning and Development, previous to that Assistant Director of Public Works. Mr. Emmons has also worked in many other capacities over his long tenure with Clearwater County. He holds a designation as Certified Local Government Manager (CLGM), he completed a National Advanced Certificate in Local Authority Administration (NACLAA) from the University of Alberta and he has numerous other educational credentials specific to municipal administration. 1. Possibly the most notable highlight was Earl Graham’s news at the beginning of the meeting that he would not be seeking re-election this fall. He noted that he had spoken to a couple of others that might be interested in running in his division. 2. The council voted to uphold their previous practise of not providing maintenance on undeveloped road allowances. 3. Three readings were given, and passed, to the Crimson lake Cottage Association’s request for a dust control agreement whereby dust control would be provided in 2017 and that a special tax to cover this cost would be applied to their taxes beginning in 2018 for the following three years. 4. A delegation from the Rocky Ag. Society gave a brief report on the recent public meetings they had held to provide information and gather input on their proposed new Rocky Ag. Rec Facility. They had met with various potential user groups (4-H, equine groups, general public, and contractors/potential sponsors). In his report Art Terpsma stated that the attendance averaged 20-35 at these meetings. I attended three out of the 4 meetings and at only one of them was there an attendance over 20 (23) and that was that the equine meeting but the count also included the Ag. Society members/presenters. At the last one for the contractors/sponsors there was a total of 12 people, 5 of whom were Ag. Society members. Art did mention that they had visited the new facility in Claresholm and that it is only 150 feet wide and geared for a competitor arena. The previous feasibility study done for the proposed one here had suggested a width of 250 feet. He also mentioned that a representative from Rimbey had attended one of the meetings to describe the hoops they had had to go through in building their facility. In conclusion, Art mentioned that there is still lots of work to do and items to be ironed out. This includes ownership of the land (who will hold title) and the operation procedure. He was hoping that it could be a community building run by a community board. Comments from the council included ones from Councillor Laing who asked about grant possibilities; Councillor Duncan who expressed concern about dropping the width as we don’t want to be hindering future possibilities; and Councillor Alexander who suggested that the Ag. Society meet with administration to address some of the concerns, admitting that there is lots of work to be done yet but we need to keep it going. 5. 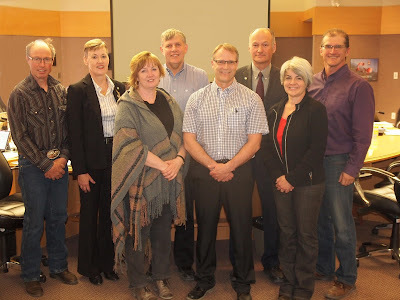 A delegation from the Cartier Creek Subdivision (in the southwest area of the county, along the Red Deer River) attended to give an opposing point of view to the “encroachment” issues on municipal reserve in that development. Previously a delegation had attended in December 2016 regarding violations on municipal reserve. While a different perspective was presented on Tuesday, council decided to uphold their decision to follow guidelines set out in Municipal Government Act and enforce those regulations with their Land Use Bylaw Amendment for Enforcement Provisions. Chickens won the day at the regular meeting of County Council when any household within a county hamlet or country residential acreage was given the green light to keep a maximum of six chickens (but no rooster!). Greg Neale and Tom Daniels from Sundre Forest Products/ West Fraser told council about their problems in regards to new American duties of 24.12% slapped on their exports to the US and the pine beetle infestation in BC and Western Alberta, which is not expected to show more than a temporary setback due to a relatively cold winter. Council was given an update on an invigorated Rocky/Kamikawa Japanese student exchange program by coordinator Kim Hastings. Bill Shaw from Bill Shaw Consulting presented council with a revised draft of the North Rocky Major Area Structure Plan which covers the area between Highway 22 and the Rocky Airport. This is a work in its early stages with much consultation ahead involving the public and the Rocky Town Council. Many issues remain to be resolved. New provincial electoral boundaries were discussed with concern being expressed over large urban municipalities benefiting at the expense of rural ones. Council decided against changing its 2/3 majority requirement in regards to a request from the Hamlet of Withrow to connect it to a municipal wastewater system. The annual Alberta Walk for Children was hosted by the Royal Purple and Elks Lodges of Caroline on Saturday May 27, starting and finishing at the Caroline Elks Youth Centre. 24 walkers registered for the walk which took participants through some of the parks and playgrounds in Caroline. Reportedly, some of the younger participants would have preferred to stay at the playground rather than keep walking. The event, which was blessed by sunny weather, culminated in a beef-on-a-bun dinner at the Youth Centre. Next year's walkathon will take place in Red Deer. All councillors were present at the regular meeting on February 28 to hear a delegation from the Town of Rocky Mountain House report on public concerns over a discharge from the Town sewage lagoon into the North Saskatchewan River. The Town’s Director of Engineering and Operations, Rod Fraser, reported that levels of solids and ammonia products, exceeding new federal regulations, had indeed been discharged into the river and that the Town is working to identify the causes. Several county councillors expressed concern over a lack of communications between the Town and County in light of the fact that the two municipalities are sharing the cost and use of the Rocky Mountain House wastewater treatment facility. Maintenance of another shared facility, the Credit Union Co-op Aquatic Centre in Rocky Mountain House, was discussed as well with a request for an additional $61,400 to shore up the deck around the pool in 2017. Doing all the work needed in 2017, rather than spreading it out over two years as originally planned, will result in an overall cost saving. Council approved the additional funding. A delegation from the Clearwater Broadband Foundation, a local recently formed not-for-profit society, made a video presentation arguing for the case of optical fibre as the solution for local residents’ access to the internet. John Reid, Secretary/Treasurer of the foundation, stated the intention of the group of digging in fibre clusters to serve six different areas of the county, including one in Nordegg. These clusters would initially be served by signals from/to adjacent microwave towers to be erected by the group. Funding, in the form of $3.48 million of loans guaranteed by the County, would be needed for these projects. Council accepted the presentation as information. Based on a recommendation from Public Works, Council decided to post “No winter maintenance” signs on roads in the west country that are not being graded in the winter. It was noted that snowmobilers can and do use these snowy roads. All councillors except Kurt Maki were present at the February 14 County Council meeting where a major decision regarding Nordegg development was made: Based on a presentation and recommendation from West Country Manager Rick Emmons, Council gave the green light to the development of a 29 lot mobile home park in the vicinity of the municipal building in Nordegg at a cost of $2.55 million. Council also approved 5.2 km grading and other work to the Northfork Road. A bid from Netook Construction Ltd. for a total of $1.354 million was accepted. Councillor Theresa Laing brought a concern over Town of Rocky Mountain House lagoon use to the attention of Council. It has been suggested that county based sewage trucks may have exceeded the capacity of the sewage treatment plant when dumping their loads resulting in raw sewage being discharged into the North Saskatchewan River. CAO Leaf was asked to look into the matter by Council. A decision by the Clearwater County Council on December 13, 2016 to amend an agreement with the Sundre Fire Department to provide fire suppression and rescue services to the southern part of Clearwater County has generated a negative response from the Sundre area: Based on a rationale of cost savings, it was decided that the Caroline Fire Station should be the first responder in this area, rather than Sundre. Clearwater Regional Fire Rescue Services Chief Jesse Kurtz made a presentation to Council in response to this unexpected development. CAO Leaf is scheduled to meet with the Town of Sundre CAO to deal with the matter. For the time being, the Sundre Fire Department will continue to be the fire service provider for the area south of Highway 587 and west of Sundre. An "In Camera" session at the end of the meeting was labelled "Third Party Interest" in the agenda. Judging by the group present in the council chamber at that time it is assumed that the "third party" is the Clearwater Broadband Foundation as represented by its board. There was discussion right from the outset at the first regular meeting in 2017 on Tuesday, January 10: Councillor Vandermeer pointed to a discrepancy in the minutes from the December 13 regular meeting pertaining to a motion from Vandermeer for the county to go ahead with a broadband demonstration program in 2017. The minutes, as presented to council for ratification, did not reflect this intent and the minutes, as amended by Vandermeer, were adopted by council. Detailed information on the 2017 winter gravel program was presented by Public Works, where it was noted that the amount of gravelling done would depend on weather conditions. Alberta Municipal Affairs’ recommendation for Council to hire a consultant to carry out a review of county operations was turned down unanimously on a motion from Councillor Duncan. 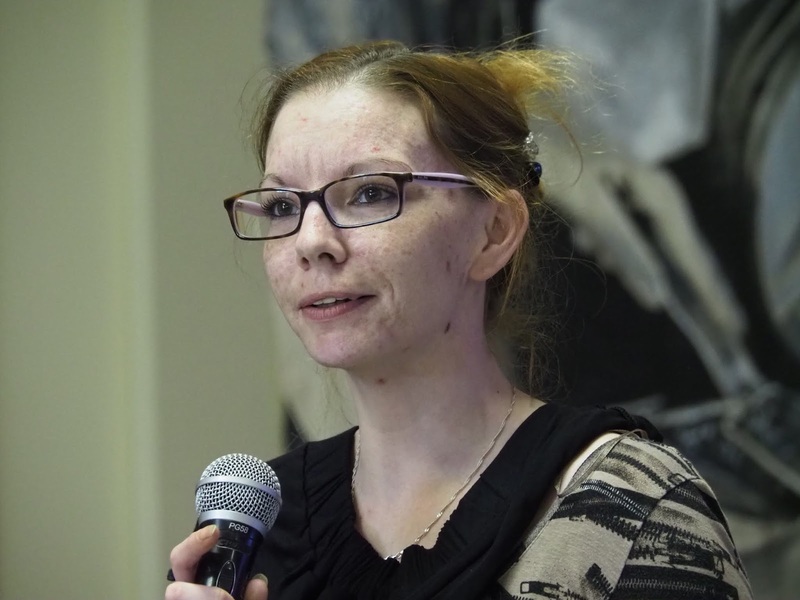 The sentiment was that Council already had a good idea of where there are shortcomings, notably in its communications with the public strategy, as identified in the municipal inspection of the Town of Rocky Mountain House where improvements were recommended. Also, Councillor Vandermeer believed that $75,000 could be better spent elsewhere. Based on a recommendation from Regional Fire/Rescue, Council decided to go ahead with the purchase of a replacement fire engine for the one that was written off following a rollover in October. The cost to the County will be $163,851, the remainder of the total purchase price of $588,851 being covered by insurance. A delegation from the “Clearwater Regional Tourism Working Group” presented the newly designed logo to be used to promote the region. The logo depicts voyageurs in a canoe and asks the visitor to David Thompson Country to ”challenge your inner explorer”. 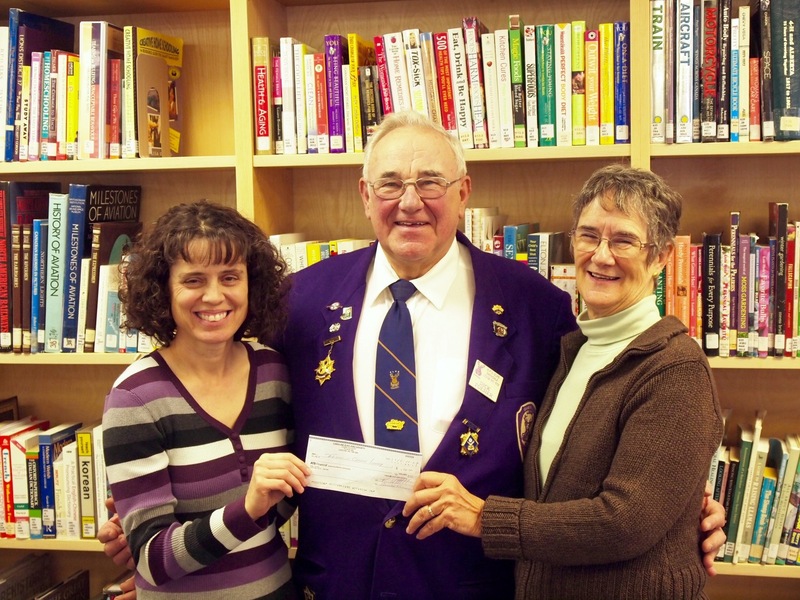 "The Friends of the Caroline Library, represented by Leslie Detta, Judy Winter and Jackie Cooper, donated an amount of $3,800 to the Caroline Library represented by Amanda Archibald. Some $1,800 will go towards the maintenance of the photo copier over the coming year. The remainder will be spent as needed by library staff. The library provides a range of services to the Caroline community and is a busy place. The Friends of the Library are looking for like minded community members to help out." I attended two full day 2017 Budget presentation sessions to Council held on December 14 and 16. The public was invited to attend but no printed or electronic information was made available, including a agenda. The only visual information observed were spreadsheets presented on projector screens. So, apart from listening to what was said by staff and councillors, rough notes could only be taken on the fly. No motions of any kind were advanced or voted on during the two days, however, Councillor Maki in particular expressed concern over proposed increases in spending in most departments. Late on Friday afternoon, it was decided to call another meeting this Monday, December 19 in order to come to some kind of resolution. CAO Leaf suggested that Council might choose to run with an interim budget based on 2016 numbers, as important decisions over 2017 spending need to be made by Council in the first quarter of that year. I will not quote any numbers in this article for the simple reason that no printed information was made available and any numbers in this article could easily be disputed without information to back them up. Delegations make attendance at County Council meetings interesting for observers. That was the case on December 13 when three people from the Cartier Creek subdivision along the Red Deer River south west of Sundre brought their concerns over encroachments by neighbours onto Municipal Reserve land adjacent to the subdivision to the attention of Council. Jo and Glenn Allen and Stephen Kenny, using a photo and map presentation format showed how several river front lot owners have placed permanent structures between their properties and the river bank, effectively preventing the public from walking along the bank. The group appealed to Council to take decisive action on this issue. Michelle Swanson and Bob Haagsma from the Clearwater Broadband Foundation, which is now a registered not for profit Society, presented a case for municipal support for their project which seeks to provide affordable broadband internet service to all residents in Clearwater County. Council was told that some 200 memberships at $20 each had been sold to local people in the last few days indicating a latent demand for this service. Council decided to direct staff to work with the Clearwater Broadband Foundation to initiate a broadband project in 2017. 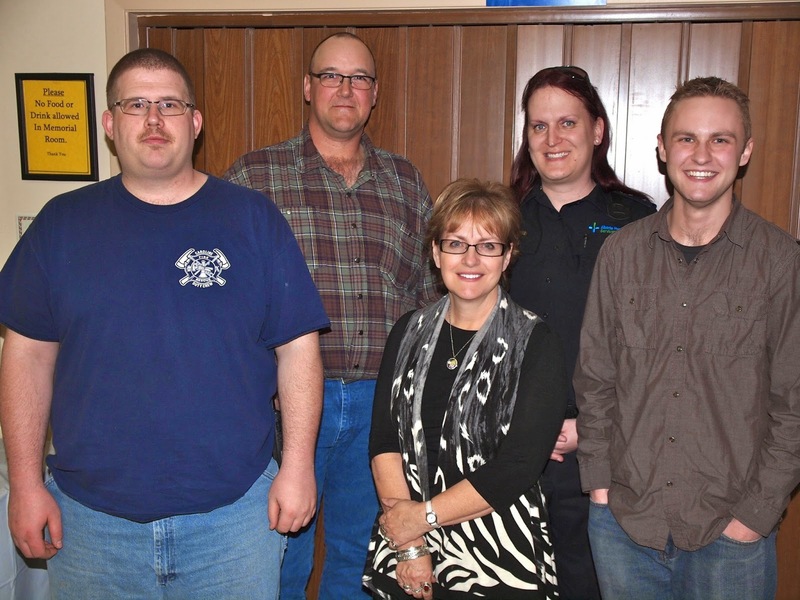 Clearwater County now has an interim Fire Chief who was presented to Council. He is Jesse Kurtz, a retired Deputy Fire Chief with many years of service from Southern Alberta, who has now taken on the duties of Cammie Laird who resigned from her post a short while ago. Bob Winship, Pembina Timberlands Forest Resources Manager for Weyerhaeuser gave an update on company activities in the area. He noted that a new approach will be used in consulting with the general public, moving away from standing committees towards individuals. Council accepted as information a closeout report on the planned new administration building and operations facility north of Rocky. Preliminary earth work has now been completed and further work will depend on Council approval for the next stage. Meanwhile, decisions in regards to the use, or otherwise, of services, like water and sewer, etc. from the Town of Rocky Mountain House, will have to be made. (Public Land Use Zone) designations, potentially causing problems for people who make their living in the west country and so possibly limiting County revenues as well. Four delegations presented their cases at the regular meeting on November 22. County involvement in internet service to local residents was also discussed. Members of an Agriculture Recreation Committee made a case for a recreational complex to be constructed on the newly acquired county lands near the Rocky airport. The total cost of the project is estimated at $22 million with approximately one half of the money potentially coming from municipal sources. Art Terpsma presented the case for a facility with a number of other people interested in the project in attendance. Reeve Alexander responded by advising the committee to broaden its base of community support for the complex before the County would become actively involved. Council did, however, carry a motion to make its airport lands available as a potential site. David Gummer, Wildlife Biologist with Parks Canada, made a presentation on the planned re-introduction of bison into the Banff National Park. 16 animals will be moved from Elk Island National Park into a controlled area on the eastern slopes of the Rockies in the Banff park for a trial period of 5 years. Don Livingston and Ed Van Heeren made the case for County support for the Rocky Mountain House Search and Rescue group in its upcoming 2017 budget. The group is a registered society and has entered into a cooperative relationship with the municipally controlled Clearwater Regional Emergency Management Agency. It has a broad volunteer base and is looking to replace capital equipment and upgrade skills and equipment to be able to participate in helicopter rescue operations. The County is increasingly being asked to give financial support to local volunteer groups. This trend was affirmed by a delegation from the Prairie Creek Memorial Cemetery Association who asked for some $7,000 to $10,000 to replace a gate and fencing around the cemetery. Reeve Alexander said that the request would be considered during the 2017 budget deliberations. A related issue came up shortly afterwards in regards to the costs of demolishing the Taimi Hall which came in at $73,405; 33,405 over budget due to the need to dispose of asbestos in the debris. The County’s electronic information system is in very poor health. This became evident during a presentation by Corporate Services Manager Rodney Boyko when he requested an amount of $50,000 over and above budgeted costs to deal with ongoing problems. The request was granted. “Broadband Request for Proposal - Focused Study Area”. After a good amount of discussion where previously held positions and beliefs were restated, it was resolved to release the full text of the TaylorWarwick Broadband Internet Study to the public. The agenda item under discussion was re-tabled until the next regular meeting. Finally, on a positive note, Public Works Manager Marshall Morton reported that a tender for asphalt overlay of 22 km of the Prairie Creek Road came in $1 million below the estimated cost of $3.9 million. Good deal! Friends of the Caroline Library, Allison Hewitt and Barbara Lee received a cheque for $500 from the Caroline Elks represented by Richard Foesier, on Wednesday, November 16. The money will be used for non-budget items needed by the library. A silent auction of donated items to support the library is currently underway at ATB Financial in Caroline until November 25. 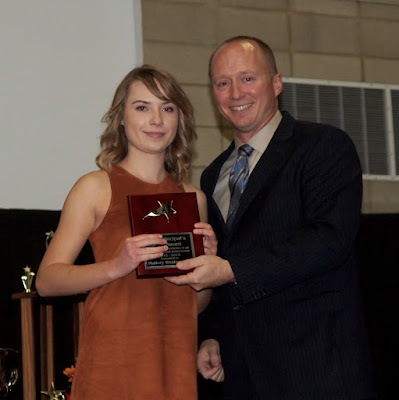 Award is presented to Mallory Westergaard by Caroline School Principal Dean Pilipchuk at the school's annual awards night on October 28, 2016. Mallory excelled in all areas of student achievement, including academics, sports, citizenship and leadership. This award is the highest recognition given by Caroline School. Today, October 25, Council held its annual organizational meeting where Reeve and Deputy Reeve for the upcoming year are elected from within the group of seven councillors by the councillors. Some fifty community boards are also populated by a mixture of community members and councillors. Following the organizational meeting, a regular meeting was conducted where crime statistics were presented by members of the Rocky RCMP Detachment. With all seven councillors present, CAO Ron Leaf opened the organizational meeting, asking for nominations for the position of Reeve. Councillor John Vandermeer took the floor and and expressed a lack of confidence in how Reeve Alexander had conducted himself over the past year. He nominated Councillor Graham who declined the nomination. He then nominated Councillor Maki for the position of Reeve. Maki declined the nomination. He went on to nominate Councillors Duncan and Laing in that order. Both declined the nomination. The process ended up with Councillor Laing nominating Councillor Vandermeer and Councillor Greenwood nominating Councillor Alrxander for the position of Reeve. Both accepted the nomination and CAO Leaf collected the votes which were counted with the assistance of Staff person Christine Heggart. Alexander was elected for the upcoming year. The number of votes for each person was not disclosed. There was a change in the Deputy Reeve chair: Councillor Maki replaces Councillor Graham. For the upcoming year, the Municipal Planning Commission will have councillors Graham, Duncan and Maki serving, along with community members Cheryl Dezall and Kelly Spongberg. Councillor Laing was not successful in getting on the Rocky Mountain Regional Waste Authority Board, where Councillors Alexander, Graham and Maki will continue to represent the County. The newly formed Clearwater Broadband Foundation had requested a councillor appointment by letter. Councillor Vandermeer agreed to represent the county council on this board, with Councillor Duncan as the alternate. Following the organizational meeting, Staff Sgt. Mark Groves and Sgt. Jason Penner from the Rocky RCMP Detachment made a presentation. Auto thefts were down in number compared to last time a presentation to council was made. Property crimes in the area have increased in line with a province wide trend. Sgt. Groves noted that the detachment is now at full strength, and even a bit over, as he has been accepting junior RCMP members into his detachment with the idea of training them to perform at a high level in their work. He also noted that the newly appointed constable to Caroline School, Brian Bouchard, used to be a teacher and school principal before joining the RCMP. A permanent Rocky RCMP satellite station at the Sunchild and O’Chiese reserves has considerably improved policing in that area. When asked by Reeve Alexander about an RCMP presence at Nordegg, Groves said that he could not justify keeping a member out there, based on population numbers. Sgt. Penner added: “It is a summertime deal” . 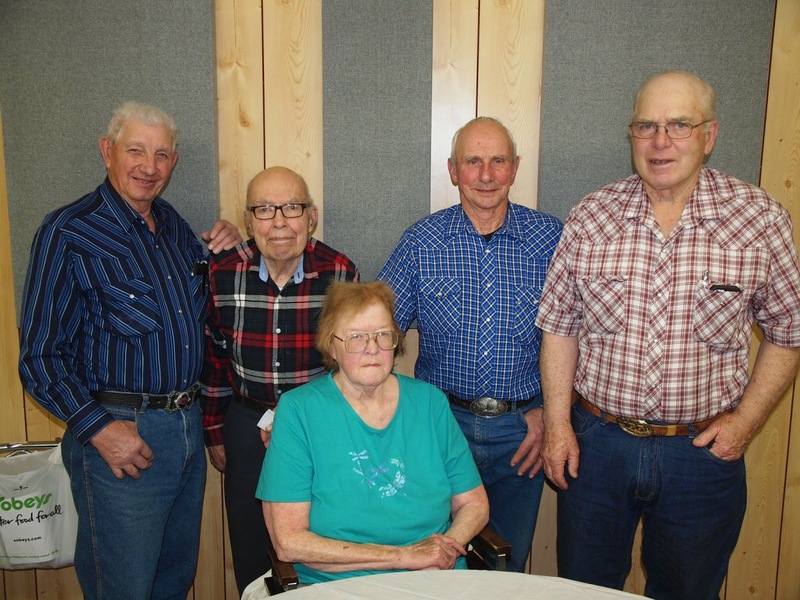 Lawrence Stewart, Don Ellis, Sharon Delorme, John Bugbee and Roy Follis. They were all born in the month of April. The volunteer appreciation event was hosted in the Caroline Legion Hall with the guidance of Marjorie Peters. 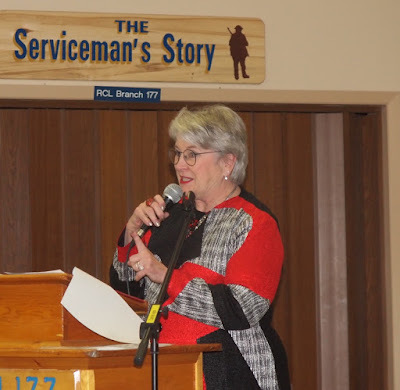 Over 200 volunteers were recognized in the Caroline Community on April 13 as part of Volunteer Week celebrations. They were all nominated by community people who had to pay $2 for each name submitted. Some 80 people attended the event and enjoyed good fellowship and snacks along with lots of door prizes. The event was organized by volunteers from several community organizations. Caroline Election Forum from Helge Nome on Vimeo. Moose browsing from Helge Nome on Vimeo. Rocky Air Show 2013 from Helge Nome on Vimeo.